This cabin was so enjoyable, clean,quiet,easy to use. Great kitchen, drinking water provided was much appreciated! We are eager to return sometime soon. Close to groceries, hiking, Grand Marais. I only interacted with one staff member but he was super nice! Room #8 was perfect for the two of us! So cute and cozy, we will definetly return! My only complaint was that it was very obvious we had upstairs neighbors, we could hear every footstep. Cathy's Cove had a beautiful view from the deck! It was wonderful to sit out and read a book and listen to the waves crash. The house had all of the things we needed for our stay - kitchen utensils, pots and pans, dishes, towels, linens, etc. We had a great stay! Everyone I talked with regarding this rental was GREAT! Very conveniently located just outside of Two Harbors. The cabin is furnished and decorated tastefully and very clean. Very responsive - had a couple of small things that needed to be fixed and they had someone out there right away. Fantastic location on Caribou Lake and we have rented on this lake for 12 years. Very good swimming and kayaking, paddle boarding, etc. Neighbors friendly and helpful. We stayed at castle rock to celebrate our anniversary and it was a blast. There were a few beer cans and cigarette buds out by the shore when we arrived and did a walk through but other than that it was beautiful. So excited for our next trip here. The bedrooms were good enough for all of us. The only other issue we had was the patio door gave us a little trouble locking it. We stayed here late July '17 for the All Pints North summer brew fest held at Bayfront Festival Park. We had 4 guys in the home, and had a great time. Very clean place, enough room with the 3 beds and pull-out couch, 2 full bathrooms. This is a much better option than any of the hotels nearby when you have 4 people! Easy walk to everything, including Bayfront. The added bonus of having a designated, secured garage spot was great, as parking in canal park can be awful. We will be staying here again!! We love this house. This was our 12 year there. We were glad to see some improvements have been made such as the blinds in the living room. The gardens are particularly beautiful this year. The stairs to the lake are deteriorating and more crooked. The railing is difficult to use as the hand rail was put on backwards. I have mentioned this before. My family had a wonderful time during our stay at chateau23. My son totally loved the loft space. The view was amazing from the balcony. The Heritage House and amenities were perfect for our large group. The 3 units (A,B,C) gave us plenty of space to stretch out and relax as well as meet in both small and large groups for meals and conversation. The location was very central for all of the activities we participated in Cook County as well. We do plan on returning! What an adorable lovingly restored cabin, sitting right on Lake Superior surrounded by woods. We had an overall great experience, would highly recommend and use again in the future. We absolutely enjoyed our time at Caribou Cove. 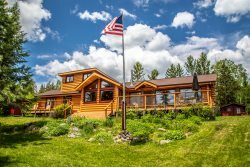 The house was better than we expected, perfect location, beautiful and peaceful lake, lots of hiking, restaurants and other north shore activities within easy driving distance. They were very pleasant and offered some awesome unknown locations to visit. Loved the location, the view and the condo!